St. Sabba Trlajic of Serbia. Our father among the saints Sava (Triajich) of Gornji Karlovac (Serbian: Свети свештеномученик Сава горњокарловачки) was a bishop of the Church of Serbia, who during World War II was arrested, tortured, and martyred by enemy Italian and Croatian personnel. Svetozar Trlajich (Светозар Трлајић) was the son of Stephen and Jelisaveta (maiden name Karakaševich). He was born in Mol on July 18, 1884. His education included primary school in his hometown, grammar school in Novi Sad, and seminary in Sremski Karlovtsy. Svetozar graduated from the Faculty of Law at the University of Belgrade and passed the qualifying examination for judges at the Faculty of Law in Zagreb. In 1909, Svetozar was ordained deacon by the Bishop of Timisoara and then presbyter ten days later. As a parish priest he served at parishes in Peška and Bašaid. Early in 1927, he was appointed to an administrative position, and later principal secretary, of the Holy Synod of Bishops of the Church of Serbia. A widower, he took monastic vows on October 27, 1929 in the Krushedol Monastery, being tonsured with the name Sava. Soon afterwards he became rector and archimandrite of the Krushedol Monastery. On September 30, 1930, Sava was elected Auxiliary Bishop of Sremski. He was consecrated in Sremski Karlovci by Patriarch Barnabas, Bishop Emilijan of Timok, Bishop Jovan of Niš, Bishop Tihon of Zahumlje-Herzegovina, and Bishop Simeon of Zletovo-Strumica. As Patriarchal Vicar Bp. Sava chaired the diocesan council of the Archdiocese of Belgrade-Karlovtsy. From early 1937, Bp. Sava chaired the ecclesiastical court. He was appointed Bishop of Gornji Karlovac on June 22, 1938, with his residence in Plashkom. After the death of Bishop Miron of Pakrac in 1941, he was also named administrator of the Diocese of Pakrac. After the invasion of Yugoslavia and the formation of an independent Croatian state, Plashkom was first occupied by Italian forces and then turned over to the Ustashi Croatians in late 1941. Bp. Sava and nine priests were then taken hostage. On [[May 23[[, 1941, Ustashi occupied the bishop's residence and expelled Bp. Sava. On June 8, the notorious executioner Joseph Tomlenovich ordered all diocesan money and records to be handed over to the Ustashi. Bp. Sava refused the Ustashi order to leave his diocese and go to Belgrade. Not wanting to abandon his flock, he refused. Bp. Sava was arrested on June 17, 1941, and confined, together with three other Serbian priests and thirteen eminent Serbian laymen, in a stable of the Ustashi Joseph Tomlenovich in Plaskom. After experiencing intense torture, Bishop Sava and the priests, Bogoljub Gakovich, Đuro Stojanovich, and Stanislav Nasadilo, were chained and taken to Gospich concentration camp on July 19. There, they were tortured until mid August. At that time Bishop Sava was taken together with 2000 Serbs toward the Velebit Mountain. Somewhere on this mountain he suffered a martyr’s death together with thousands of other Orthodox Serbs. The site where Bishop Sava died is still unknown. 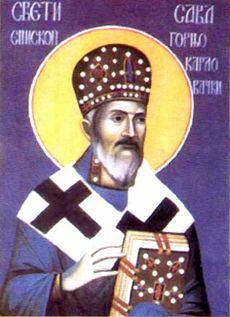 In 1998, at the regular session of the [Holy Synod|Holy Assembly of Bishops]] of the Serbian Orthodox Church Bishop Sava was glorified and entered on the list of names of the Serbian Church saints as hieromartyr. This page was last edited on October 23, 2012, at 19:43. This page has been accessed 17,583 times.